"Home is where we start from, but home is also where we are bound for, the place we always seek." And such is the case of Erchless Estate. Erchless is where Oakville started—with one man’s vision and a family with a desire to make a mark upon the land that they now called home. Erchless was home to six generations of the Chisholm family over a period of 130 years. The home was completed by Robert Kerr Chisholm in 1858 and named after the Chisholm clan seat in Invernesshire, Scotland. 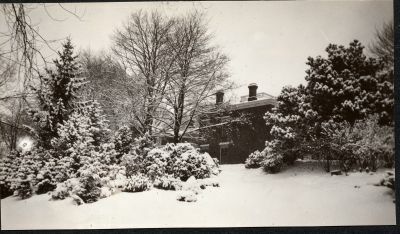 Robert Kerr and his son Allan (1866-1918), made extensive improvements to the home and grounds, adding gardens, a tennis court, gardeners cottage and stables, and a stately carriage path. The estate, as it stands today, resembles the further renovations that were completed by Emelda Beeler Chisholm (1873-1951), and that were so carefully thought out by a wife and mother who took great care to preserve the Chisholm heritage. Erchless remained in the Chisholm family until the 1960s, when it was sold and further divided into apartments. The Town of Oakville purchased the home in 1977 and the final tenants moved out in 1989. The Erchless Family Home was opened to the public on May 18, 1991. With the opening of the Estate to the public, it truly began to tell its story as the ‘grounding’ for a family that spans the world. The following essay was created in partnership between the Oakville Public Library and the Oakville Museum at Erchless. It is based upon two photographic albums that were compiled by Hazel Chisholm Hart Matthews sometime in the late early 1960’s. It is with these photographs and text largely based upon Hazel’s own work, that a venture is made to capture the magic that inhibits Erchless Estate today as the long standing home of the founding father of Oakville and his prominent family.